A resident of the Chicago area for more than 20 years, Kathryn holds a Masters Degree from Northwestern University in Voice and Opera. While simultaneously singing and working as a personal trainer, Kathryn attended a Pilates workshop taught by respected Chicago Gyrotonic, Pilates, and Feldenkrais practitioners Kathleen Aharoni and Suzi Marks. Intrigued by their neuromuscular approach to freedom of movement, Kathryn was inspired to pursue a certification with them. Motivated by the results she saw in her clients, and frustrated with the superficial nature of conventional exercise, she decided to make mind-body fitness a career. 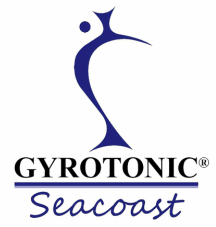 Kathryn's first experience with Gyrotonic exercise occurred in 2005 while training for a half-marathon; she soon after became certified in Miami in 2006 while seven months pregnant. Since then, Kathryn has devoted her time to mastering this system, which she feels is the most progressive, invigora﻿ting system of exercise today, both muscularly and energetically . Kathryn first trained under Master Trainer Alissa Getz, in both Gyrotonic Level I and II and Gyrokinesis methods. Since then, she has continued her training with Master Trainers Juergen Bamberger, Lisa Pari, Erika Hassan, Billy Macagnone, Martha Mason, Veronique Breen, Anjali Austin and physiotherapist Uwe Herbstreit in Applications f﻿or the Shoulder Girdle, Applications for Pelvic Girdle, Psoas Principles, Applications for Tennis, Creative Workshop, Gyrotonic Jumping Stretching Board, Gyrotonic Archway, GYROTONER®, Gyrotonic Ladder, pre-trainer update courses, Gyrokinesis Spinal Essentials Course, Gyrokinesis Breathing Intensive Course, Gyrokinesis Lotus Blossom 2 Course and Gyrokinesis Level 2 Beginner. In 2015 Kathryn travelled to Ubud, Bali to complete the Gyrokinesis Level 2 Course with the method creator, Juliu Horvath. Originally from New Jersey, Kathryn and her family decided to make New Hampshire their home in 2012. She is thrilled to be living here, raising her children in lovely New England, where they all enjoy the ocean, forests, and mountains.